There's nothing like a pool party to heat things up when the temperatures drop. The dry variety is preferred by members of the Cummerbund Society, who gather each year at the Duquesne Club to play billiards. John Hegnes shoots as Fred Kunz watches. The 16th annual Pool Tournament, to benefit Magee-Womens Hospital's Neonatal Unit, was as much fun as ever Thursday night, with complimentary cigars provided by the Old Allegheny Shop and Steve Boroch. Balancing scotch, stogies and sticks is no easy matter, but the boys manage. The mighty foursome, as founding fathers Mac McIlrath, Steve Bonnett, Jim Smith and Rusty Marmion are called, each headed up a team. It was Bonnett's teammate Tom Armstrong who outscored his friends to be this year's winner. Among those who tried to keep him down were Lawton Stokes, Dr. Jon Watchko, Tim Rusnak, Dana Pless, Dr. Alex Lese, Dennis McClelland, Kit Dooley and runner-up Bob Beynon. Who says the British are stuffy? It was a loose crowd indeed that gathered at the University Club on Thursday for "An Evening in Celebration of Robert Burns." 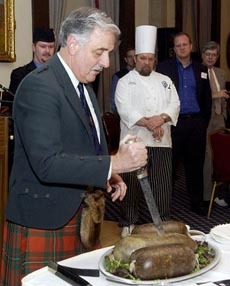 Arthur McAra carves the haggis. Hosted by the British American Business Council -- Pittsburgh Region, the evening featured a selection of single-malt Scotches, fine cigars from Poor Richard's Tobacco Shop and haggis, a gray mass of sheep guts that presumably is an acquired taste. In the Scottish tradition, emcee Arthur McAra gave the "Address to a Haggis" after it was paraded around the room to the accompaniment of bagpipes. He also recited "Immortal Memory of Robbie Burns" before Bill Kelman gave a toast to the lasses and Doreen Boyce toasted the lads. Cigar smoke leaked from the windows of the smoking building, but it didn't affect a buffet of more palatable fare that was enjoyed by Roger Cranville, Ron Frank, John Donahue, Bruce Americus, Mark Knight, Mike Meyers, Bill Mills, Vaughn Gilbert, Mike O'Donnell, Alexandra Hendrickson, Robert Adam, Don Hillier, Charles Jenkins, Frank Marfisi, Doug Reed, Pam Noblit, James Wolf, Tim Wolfson, Ron Robinson, Suzi Pegg and Ellen Greek. Pops conductor Marvin Hamlisch was in a good mood Thursday after rehearsing a tribute concert to Richard Rodgers with the Pittsburgh Symphony Orchestra. 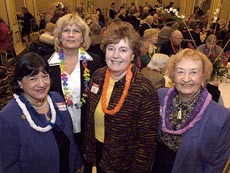 In the Regency Room, musicians and guests forgot the frigid weather by donning leis, grass skirts and sipping red punch during a luau luncheon. The soundtrack of "South Pacific" greeted 140 guests of the Pittsburgh Symphony Association, and there was plenty of happy talk. "At any moment, I thought this place was going to turn into a ship and we were going to start cruising," Hamlisch told the group. The event, chaired by Vi Besterman and Millie Ryan, combined the annual "Picnic in the Pit" for musicians with an appreciation luncheon held for suburban affiliate PSO groups that raise money for the orchestra by staging gourmet dinners, fashion shows and other events Truffles and Flourishes catered the menu of pork, chicken and tasty fruit kebabs while Timothy Wilcox provided some enchanted tropical floral centerpieces of tall white orchids, ginger root and Gerber daisies. Marge Larouere brought dessert, and Bev Elliott, Judy Clough, Janet Moritz and Kathy Stept all helped to make the event a success. Lawrence Tamburri, the new president and CEO of the symphony, dropped by to meet and greet guests.